Amerejuve offers customizable in-house payment plans with 0% interest. Call now to get more details ! At Amerejuve we are committed to providing our clients with the best and most up to date treatments possible; furthermore, we are committed to offering these cutting edge services and products at the most affordable rates. We have a variety of payment options that you may choose from. One of the most popular options is our financing plan. United Medical Credit helps set up payment plans for medical and cosmetic procedures. With more than 10 years of experience, they are known for fast financing and excellent customer service. United Medical Credit offers multiple plans to choose from with competitive interest rates, including no prepayment penalty. They are committed to ensuring you receive the medical treatment and care you need. Great rates and flexible plans No one is left behind! 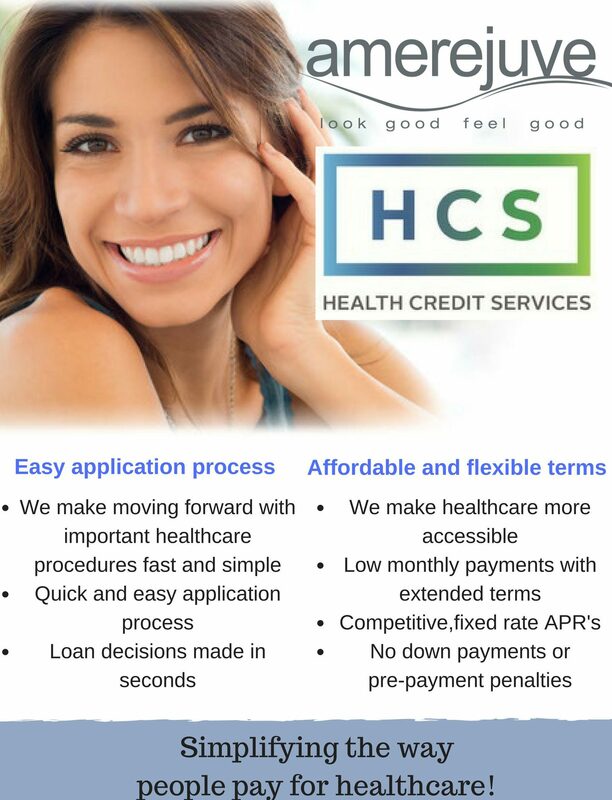 We also offer Medical Financing which is another source and between the two we cover almost all applications. MedicalFinancing.com offers convenient financing programs and flexible payment options. With available limits from $1,000 to over $25,000, including financing programs for even those with less than perfect credit. Rates start as low as 5.99% and there are no prepayment penalties.